One of the downsides of being a movie buff is that no matter the topic, there always seems to be a scene from a movie that provides just the illustrative image you don't want to have. For caviar, there are two and both involve Tom Hanks. The first is the holiday party scene in Big, when Tom the boy/man digs into some caviar not knowing what it is and when he finds out, he pushes it out of his mouth in the way only a grossed out kid can. The other is in the romcom You've Got Mail when he and Meg Ryan's character--also at a party--get into an argument after she discovers he's the Fox of Fox Books trying to take her down and he starts scooping up all the pricey caviar garnish to eat just to irritate her. Tom Hanks aside, caviar usually gets much more lofty treatment. In fact, it's one of those foods that is considered elite and unreachable for the masses. And, the good stuff... the really luxurious good stuff is. I can't get enough of it when given the chance, but my budget prevents me from wildly indulging. But this year I've come across a wide variety of caviars that are very tasty and pretty budget friendly. And I'm not talking about the questionable uber salty jars of fish roe you'll find on shelves at places like CostPlus. A visit to Whole Foods and Catalina Offshore Products will offer a variety of options that you can enjoy without breaking the bank. And, they're perfect for the holidays, when you're feeling oversaturated with hams and crown roast of beef and turkey. This year Catalina Offshore Products is offering a lovely Dom Petroff white sturgeon caviar, the Royal ($24.95 for 10 grams). It's a sustainably farm-raised product from Northern California. 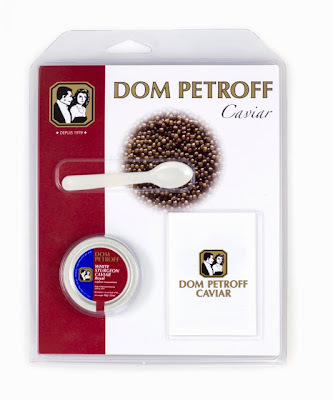 This is the first year Dom Petroff has created small containers of their products, complete with a little plastic caviar spoon and suggestions for how to enjoy it. The white sturgeon has a taste similar to Ossetra. The roe is medium sized, dark, and with a sweet buttery texture. I couldn't stop eating it with a spoon, but it's delicious on a blini with creme fraiche and a little smoked salmon or tossed with butter in fettucine. Buy some for yourself to enjoy with sparkling wine or buy a package to give as a hostess gift. Catalina also has salmon roe, which you might recognize from Japanese menus as ikura. I can't get enough of this roe ($13.50 for 6 ounces). These big, juicy beads create a wonderful salty, tangy explosion when you bite into them. I've enjoyed these on scrambled eggs, on blini, on a bagel with cream cheese (best brunch dish ever), and as a topping on stuffed mushrooms. Those stuffed mushrooms also incorporated the capelin roe ($3 for a 3-ounce package), sometimes known as smelt roe--or masago on sushi menus--and the tobikko, or flying fish roe ($14.00 for a 6-ounce package), which glistens like black diamonds in light. 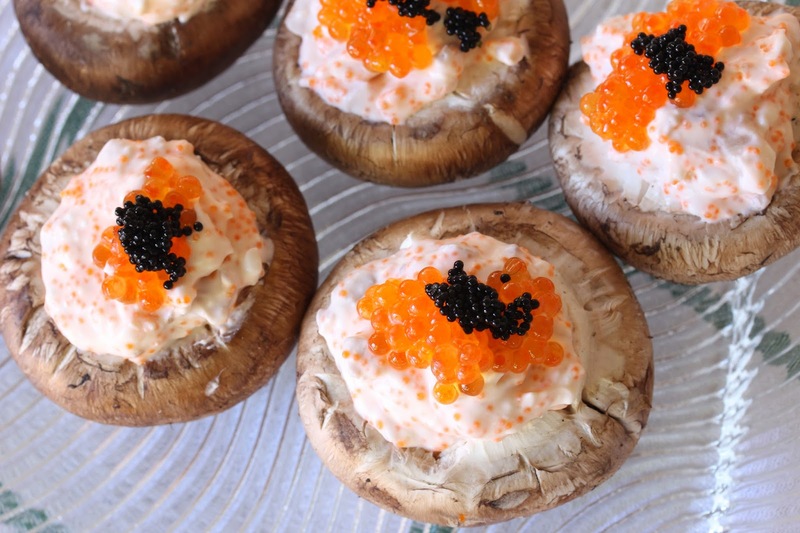 I blended the masago with sour cream and creme fraiche and chopped mushroom stems, which I used to stuff the mushrooms. Then I topped the mixture with the salmon roe and a dab of tobikko. You can also use the capelin roe to make taramosalata, a terrific Greek dip. Or use it for sushi or as a garnish. Both the capelin roe and tobikko are quite sweet and flavored with soy sauce. Dom Petroff sent me some samples in addition to the white sturgeon royal, and you can order these online. I got to try the Paddlefish roe, a small dark grey bead that looks like classic caviar, Ossetra, an imported farm-raised sturgeon roe that has a brown medium sized bead, and Hackleback roe, from wild Hackleback sturgeon native to the rivers and lakes of Tennessee and Illinois that is darker and smaller and quite briny. Cousins of the Paddlefish, to me they looked like pretty little French puy lentils. The company also sent me a jar of trout roe, which looks and tastes a lot like salmon roe. I couldn't resist putting them on a hollowed out everything bagel with whipped cream cheese. 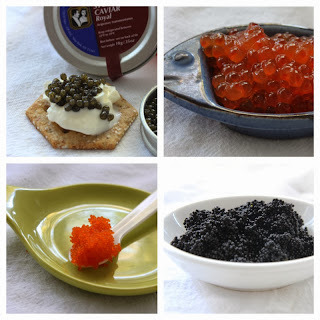 Whole Foods carries several varieties of the Caviar Russe brand. 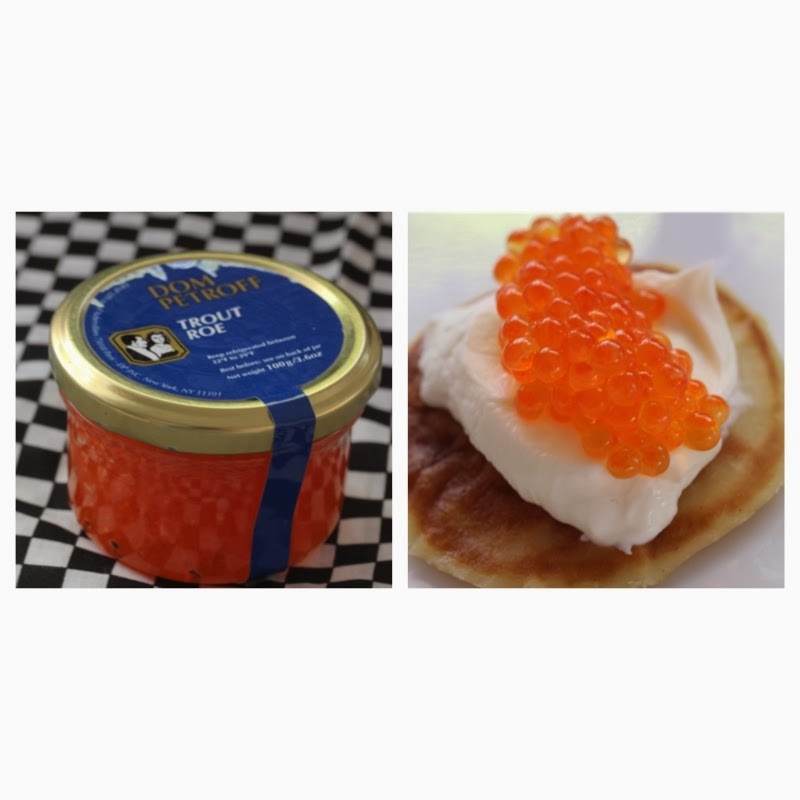 Yes, you can get a pricey ounce of imported Caspian ossetra Russian sturgeon ($89.99), but if that isn't feasible, try the whitefish caviar ($13.99 for 1.75 ounces) from the Great Lakes region, salmon caviar or ikura ($13.99 for 1.75 ounces), tobika ($13.99 for 1.75 ounces), or--what I took home and enjoyed--hardwood smoked caviar ($15.99 for 1.75 ounces). 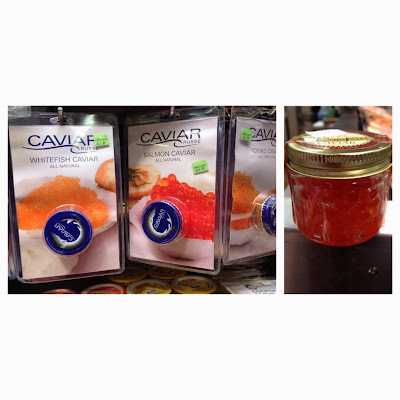 Get your splurge back on with imported Siberian Russian sturgeon ($59.99 for 1 ounce). You can also pick up a package of the brand's cocktail blinis ($7.99 for 20 count). Like the Dom Petroff prepared blinis, they are easy to heat up quickly and, while not quite as good as homemade, they are just fine and make life a whole lot easier for a busy holiday party host. A very popular offering at Whole Foods is wild salmon caviar from Echo Falls ($11.99 for 2 ounces). This is King salmon roe from the Seattle area. 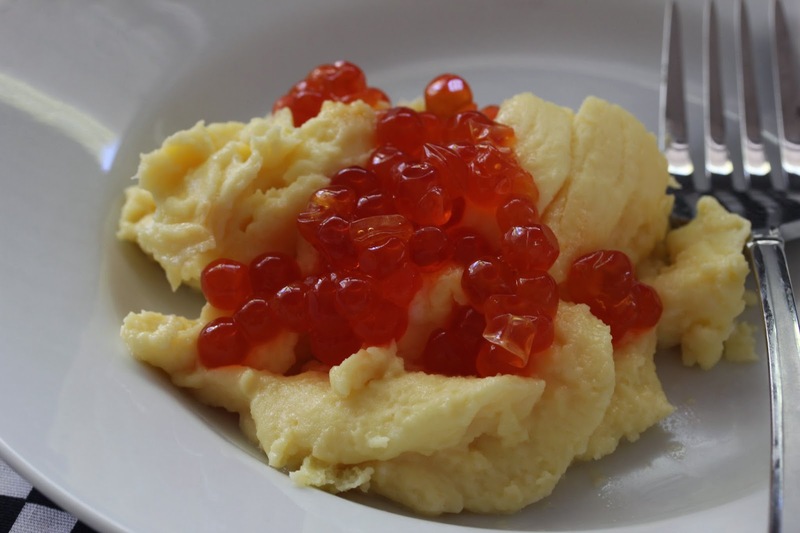 I thought long and hard about how to enjoy the smoked salmon roe and for total indulgence, made scrambled eggs in butter that I topped with the caviar. It was perfection. Now, it's all well and good for me to rhapsodize about these various roes, but given that in January Encore Champagne Bar and Dining Room is opening on F St. in the Gaslamp, I thought I'd ask executive chef Ryan Studebaker for some input. Along with champagne and sparkling wines, the menu will feature classic caviar. Studebaker discovered his love of caviar at a meal at Mr. A's. "I loved it and when it's available, I love to have it whenever possible. Caviar for me has been a social experience--when you're out to a nice meal with friends everyone can get a taste and it brings up great conversation." Studebaker points out that not all caviar is salty. Yes, the lower end ones are, especially salmon roe, but "once you get into the middle and higher-end products, it's more of an oceanic taste and very rich and creamy." The California white sturgeon and Russian Ossetra fall into that category, he notes. At Encore Gaslamp, Studebaker plans to start with dishes that showcase the different levels of caviar in terms of flavor, quality, and affordability. "As we grow as a restaurant, you'll see it make appearances in other dishes as well. 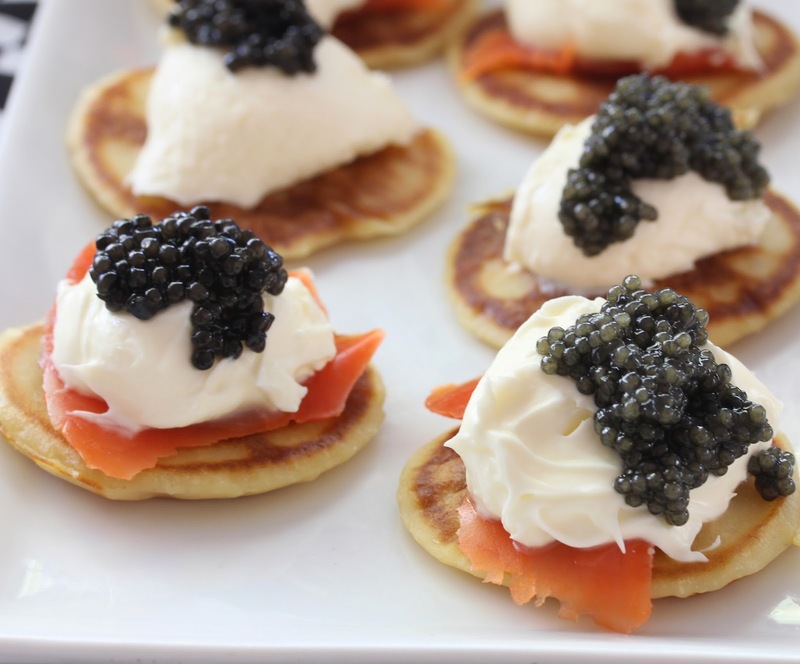 Think blinis with house-smoked salmon, creme fraiche, and chive with paddlefish or California white sturgeon caviar. We'll also have the classic full ounce platters with California white sturgeon or Russian Imperial ossetra with traditional seived eggs, red onion, and capers." Studebaker gave me two recipes to share--one for his buckwheat blinis and the other for smoked salmon. Both are pretty easy. 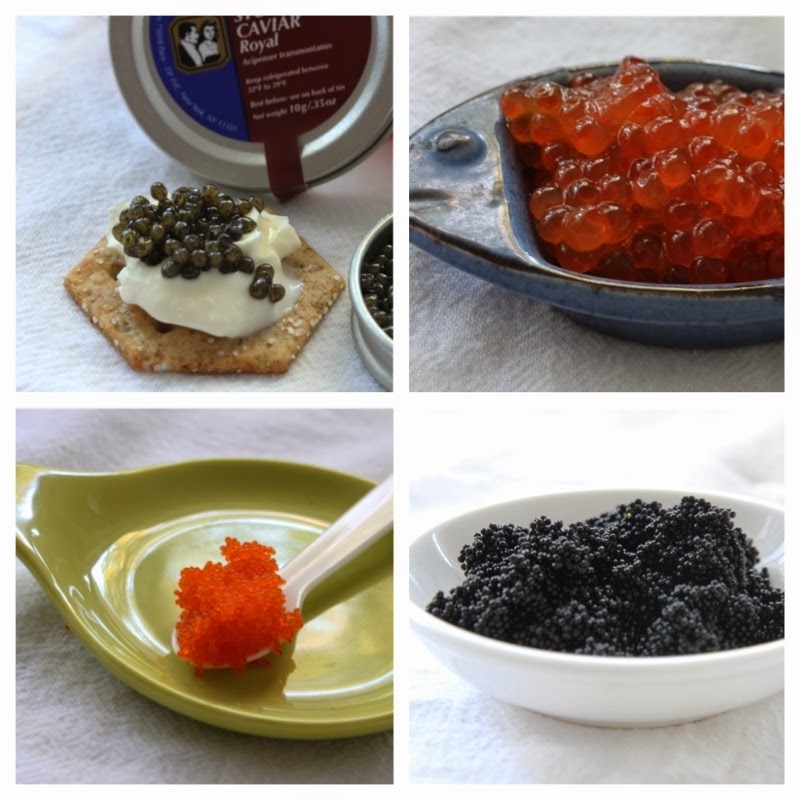 Buy a container of creme fraiche and the caviar of your choice and you'll have an impressive appetizer for a party. Rub salmon with cure and let sit overnight (minimum 12 hours, maximum 24 hours). Rinse and place on sheet trays with racks. Smoke at 140 degrees F for two to three hours. You can also use this rub with the salmon to make gravlax if you don't want to smoke the salmon. Let the salmon cure for two to three days, depending on the thickness. Tail pieces will be finished before the thicker center cut. It's done with the texture is semi firm. Flip the salmon over after each day to ensure even curing. You can even put al amount of weight on it to assist in the curing process, but it's not necessary.